V, TTV, TTVA and VA fenders have trapezoidal geometry with an embedded internal steel plate in the elastomer part that rests on the dock. These fenders offer the possibility of installing polyethylene plates in the surface in contact with the vessels in order to reduce the friction. This requires another steel plate embedded in this side in order to fix the polyethylene, either through a direct bolting or with an additional steel structure also screwed. In these cases the fender system takes the name of TTV. The result is a fender system similar to V fender, with the difference of the front polyethylene and the second plate of steel encased. 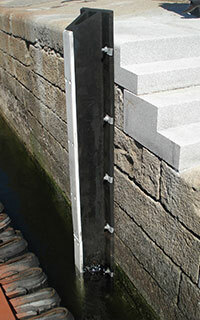 This type of fender can be installed vertically or horizontally, and the length of the fender will be designed depending on the specific need of each installation (tide races, etc). With regard to the maximum capacity of deformation of this type of fenders, the same one is of 50 % for the V and TTV fenders, and of 55 % for VA fenders. 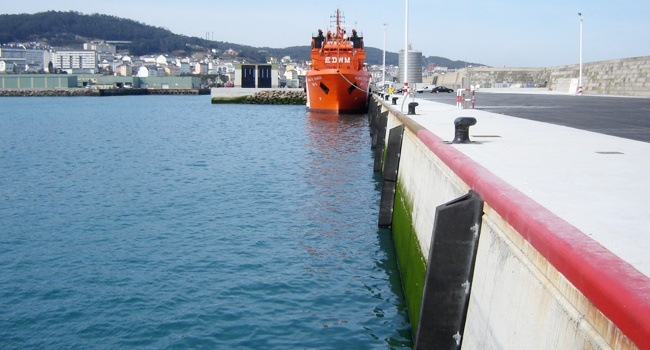 The implementation of this typology of fenders focuses mainly on fishing ports, Ro-Ro ramps and docks for medium tonnage ships in ports with medium draughts.